Might Bite is one of 18 declarations for the Timico Cheltenham Gold Cup on Friday. Nicky Henderson's gifted nine-year-old has been the long-time favourite for the main event of the four-day Festival. Might Bite was a wayward winner of the RSA last year but he has looked a much more composed animal this season. 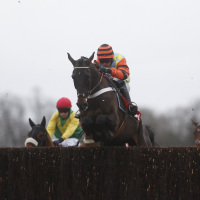 Yet the reigning King George VI Chase champion is likely to face stiff opposition from the soft-ground-loving Native River, who was third in the Gold Cup last spring. Definitly Red is also a worthy ally for North Yorkshire trainer Brian Ellison, while the Jessica Harrington-trained Our Duke heads a strong Irish challenge. Harrington's compatriot Willie Mullins has yet to win the Gold Cup and this year saddles Killultagh Vic, the mount of Ruby Walsh, Total Recall, Bachasson and Djakadam, who has twice finished second in the race. Consistent chaser Road To Respect tries his luck for Noel Meade, with Gordon Elliott set to go into battle with Outlander. Owner JP McManus is responsible for Irish Gold Cup winner Edwulf (Joseph O'Brien), last year's runner-up Minella Rocco (Jonjo O'Neill) and Anibale Fly (Tony Martin). American was supplemented for the race by Harry Fry and will be joined in the line-up by Double Shuffle (Tom George), Saphir Du Rheu (Paul Nicholls) and the Nick Williams-trained Tea For Two, who will be partnered by Lizzie Kelly. Richard Hobson has declared Shantou Flyer but he finished second to the Kelly-ridden Coo Star Sivola in the Ultima Handicap Chase on Tuesday.